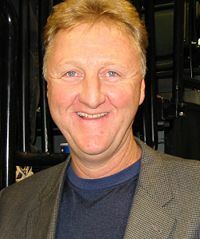 Larry Joe Bird (born December 7, 1956) is a retired American NBA basketball player, widely considered one of the best players of all time, and one of the best clutch performers in the history of sports. Drafted into the NBA sixth overall by the Boston Celtics in 1978, Bird started at small forward and power forward for thirteen seasons, teaming with legendary center Robert Parish and forward Kevin McHale. Although back problems cut short what could have been a longer career, he sported career averages of 24 points, 10 rebounds, and 6 assists in his twelve seasons. He is credited with the resurgence of the National Basketball Association in the 1980s. His storied rivalry with Magic Johnson and the L.A. Lakers, repeatedly drew record-breaking national TV audiences. He also played a role in the surge in international interest in the 1990s by being co-captain of the very first Olympic Dream Team. When Bird retired in 1992, he held or shared 27 Celtics' records. Bird personified hustle, consistency and excellence in all areas of play—as a scorer, a passer, a rebounder, a defender, and a team player. He was voted to the NBA's 50th Anniversary All-Time Team in 1996 and inducted into the Naismith Memorial Basketball Hall of Fame in 1998. After retiring as a player Bird served as head coach of the Indiana Pacers from 1997 to 2000. He earned not only the NBA Eastern Conference All-Star Team Coach honors, but also the NBA's highest coaching honor, the NBA Coach of the Year in his Rookie season as the Pacers' Head Coach. He assumed the role of president of basketball operations for the Pacers in 2003. Bird was born in West Baden Springs, Indiana, the son of Georgia Kerns and Claude Joseph "Joe" Bird. He grew up in both West Baden and the adjacent town French Lick, which earned him the nickname "the Hick from French Lick" in his later basketball career. Financial troubles would plague the Bird family for most of Larry's childhood. In a 1988 interview with Sports Illustrated, Bird recalled how his mother would make do on the family's meager earnings: "If there was a payment to the bank due, and we needed shoes, she'd get the shoes, and then deal with them guys at the bank. I don't mean she wouldn't pay the bank, but the children always came first." Bird sometimes was sent to live with his grandmother due to the family's struggles. Bird told Sports Illustrated that being poor as a child "motivates me to this day." The Bird family's struggle with poverty was compounded by the alcoholism and personal difficulties of Joe Bird. In 1975, after Bird's parents divorced, his father committed suicide. In spite of his domestic woes, Bird had become one of the better basketball players in French Lick by his sophomore year in high school. He starred for Springs Valley High School, where he left as the school's all-time scoring leader. His picture hangs in the school, which is located on what is now Larry Bird Boulevard in French Lick. Bird received a basketball scholarship to Indiana University in 1974. However, he was overwhelmed by the size of the campus and number of students and, as he would later admit in his biographies, wasn't mentally ready for this stage of life. In his own words, he said, "My problems really began when classes started. I wasn't much of a scholar to begin with, although I had gotten a good enough grade-point average to get into college. But I certainly wasn't ready for a school the size of Indiana University." He dropped out of Indiana, went home to French Lick, and worked for the sanitation department for a year. He still played basketball in community leagues and, after that year, decided to enroll at Indiana State University, where he was coached by Bob King. Bird led the ISU Sycamores to the NCAA championship game in 1979, his senior season, only to lose to the Michigan State University Spartans, who were led by his future NBA rival, Earvin "Magic" Johnson, Jr.. The Sycamores finished the season 33–1. That year Bird won the USBWA College Player of the Year, Naismith and Wooden Awards, given to the year's top male college basketball player. After playing only three years at Indiana State, he left as the fifth-highest scorer in NCAA history. Bird finished his collegiate career with an average of 30.3 points per game. Aside from basketball, Larry Bird was a typical high school student. He dated several girls but ended up marrying Janet Condra. Although the couple was very young they married prior to attending Indiana University. According to Bird, "Janet was a really nice girl, but I knew already that that we were just too different from each other to make it a really happy, meaningful relationship." The results were disastrous as the marriage lasted only 11 months, but produced a daughter, Corrie. In 1998, Corrie Bird appeared on The Oprah Winfrey Show and revealed that she was Bird's daughter from his first marriage though Larry had denied paternity until the mid 1980s. Corrie, like her father, played basketball in high school and attended Indiana State University, graduating with a degree in elementary education. Although there is no correlation between the two events, Bird met his second wife, Dinah Mattingly, about the same time as the divorce with Janet. The two would later adopt a son, Connor, and have their own child, Mariah. The Boston Celtics selected the 6'9," 220-pound Bird 6th overall in the 1978 NBA Draft, even though they were uncertain whether he would enter the NBA or remain at Indiana State to play his senior season. Bird ultimately decided to play his final college season at Indiana; however, the Celtics retained their exclusive rights to sign him until the 1979 Draft due to the NBA's "junior eligible" rule that existed at the time. The rule essentially allowed a collegiate player to be drafted when the player's original "entering" class was graduating and giving them one calendar year to sign them, regardless of whether they entered the NBA or decided to stay in college. Shortly before that deadline, Bird agreed to sign with the Celtics for a $650,000 a year contract, making him the highest-paid rookie in the history of the NBA up to that point. Soon thereafter, the NBA draft eligibility rules were changed to prevent teams from drafting players before they were ready to sign. The rule is called the Bird Collegiate Rule. Larry Bird's impact on the Celtics was immediate. The Celtics were 29–53 during the 1978–79 season, but with Bird the team improved to 61–21 in the 1979–80 season, posting the league's best regular season record. Bird's collegiate rival, Magic Johnson, also had entered the NBA in 1979, joining the Los Angeles Lakers. In 1980, despite a strong rookie season from Johnson, Bird was named the league's Rookie of the Year and was voted onto the Eastern Conference All-Star team (an honor he would receive for each of his 12 full seasons in the NBA). For the 1980 season, Bird led the Celtics in scoring (21.3 points/game), rebounding (10.4 rebounds/game), steals (143), and minutes played (2,955) and was second in assists (4.5 assists/game) and three-pointers (58). Though Boston was beaten by the more athletic Philadelphia 76ers in the Eastern Conference finals that year, Bird's addition to the team had renewed the promise of Celtic glory. Following Bird's first season, the Celtics acquired center Robert Parish and the 3rd pick in the 1980 NBA Draft via a trade with the Golden State Warriors (in exchange for the 1st and 13th picks in the draft). After the Warriors took Joe Barry Carroll with the 1st pick and the Utah Jazz chose Darrell Griffith second, the Celtics selected University of Minnesota power forward Kevin McHale. With Bird at small forward, the additions of Parish and McHale gave Boston one of the most formidable frontcourts in the history of the NBA. The three would anchor the Celtics throughout Bird's career. In his second season, Bird led the Celtics into the playoffs, where they faced off for a second consecutive year with Julius Erving's Philadelphia 76ers. Bird helped the Celtics overcome a 3–1 deficit by winning the last 3 games by 2, 2, and 1 point margins, propelling them into the NBA Finals, where they defeated the Houston Rockets in six games. It would be the first of three championships in Bird's career, as well as the first of his five Finals appearances. The additions of Bird and Johnson rejuvenated the NBA, which had suffered from low attendance and minimal television interest through much of the 1970s. Immediately upon their entry into the league, the two players became repeating presences in the NBA Finals. Johnson's Lakers won the championship in 1980, while Bird's Celtics captured the NBA title in 1981. On cue, Johnson's Lakers wrested it back in 1982. Lakers versus Celtics, and specifically Bird versus Magic, quickly became one of the greatest rivalries in the history of professional sports as they faced off in 1984, 1985, and 1987. In 1984, the Celtics defeated the Lakers in a seven-game Finals, winning game seven 111–102. Bird averaged 27 points and 14 rebounds a game during the series, earning the Finals Most Valuable Player (MVP) honor. Bird was also named the league regular season MVP for that year. In 1985, however, the Lakers avenged the loss, defeating the Celtics in game six of the Finals in the Boston Garden. That year, the NBA again named Bird the league MVP. Boston would have another great season the next year, with help from another Hall of Famer, Bill Walton. Walton had been refused by the Lakers, and as a last chance, called Celtics president and general manager Red Auerbach. Auerbach was initially unwilling to take a risk on Walton, who had been plagued for years by foot injuries. However, Bird, who happened to be in Auerbach's office at the time of Walton's call, urged him to sign Walton, saying that if Walton felt he was healthy enough to play, it was all Bird needed to hear. With Walton backing up Kevin McHale and Robert Parish, the Celtics would return to the finals in 1986, albeit not against Johnson and the Lakers, who lost in the Western Conference Finals to the Houston Rockets. The 1986 Celtic team, which finished the regular season 67–15 and defeated the Rockets in six games, is generally considered to be the best of Bird's career. Bird again was named the Finals' MVP for that year, averaging 24 points, 10 rebounds and 10 assists per game for the series. He also won his third consecutive league MVP award, a feat matched only by the great Celtic center Bill Russell and the dominant Wilt Chamberlain, who played for Philadelphia and Los Angeles. In 1987, the Celtics made their last Finals appearance of Bird's career, fighting through a difficult series against the Milwaukee Bucks and Detroit Pistons but as they reached the NBA Finals, the Celtics, plagued by injuries, lost to a dominant Lakers team which had won 65 games during the season. The Celtics ended up losing to the Lakers in six games. The Celtics would fall short in 1988 losing to the Pistons in six games in the Eastern Conference Finals as the Pistons made up from the heartbreak the previous season. During the 1986-1987 season Bird became the first player ever to shoot at least .500 from the floor (.525) and .900 from the free throw line (.910) in the same season. He repeated the feat in 1987-1988 with .527 and .916. Also, in 1987-88, Bird was the first Celtic ever to record a 40-20 game, with a 42-point, 20-rebound effort against Indiana. He averaged a career-high 29.9 points that year, falling just five points short of averaging 30 per contest. Bird also won his third consecutive NBA Long Distance Shootout title, a feat later matched by Chicago Bulls' Craig Hodges from 1990-1992. Throughout the 1980s, contests between the Celtics and the Lakers, both during the regular season and in the Finals, attracted enormous television audiences. The first regular season game between the Celtics and the Lakers in the 1987-1988 season proved to be a classic with Magic Johnson banking in an off balance shot from near the 3-point line at the buzzer for a 115-114 Lakers win at [Boston Garden]]. The historical rift between the teams, who faced each other several times in championship series of the 1960s, fueled fan interest in the rivalry. Not since Russell squared off against Chamberlain had professional basketball enjoyed such a marquee matchup. The apparent contrast between the two players and their respective teams seemed scripted for television: Bird, the introverted small-town hero with the blue-collar work ethic, fitted perfectly with the throwback, hard-nosed style of the Celtics, while the stylish, gregarious Johnson ran the Lakers' fast-paced "Showtime" offense amidst the bright lights and celebrities of Los Angeles. A 1986 Converse commercial for its "Weapon" line of basketball shoes (endorsed by both Bird and Johnson) reflected the perceived dichotomy between the two players. In the commercial, Bird is practicing alone on a rural basketball court when Johnson pulls up in a sleek limousine and challenges him to a one-on-one match. Despite the intensity of their rivalry, Bird and Johnson became friends off the court. Their friendship blossomed when the two players worked together to film the 1986 Converse commercial, which depicted them as archenemies. Johnson appeared at Bird's retirement ceremony on February 4, 1993 and emotionally described Bird as a "friend forever." In 1988, Bird had the best statistical season of his career, but the Celtics failed to reach the NBA Finals for the first time in four years, losing to the Pistons in six games during the Eastern Conference Finals. Bird started the 1988–1989 season with Boston, but ended his season after six games to have bone spurs surgically removed from both of his heels. He returned to the Celtics in 1989, but debilitating back problems and an aging Celtic roster prevented him from regaining his mid-1980s form. Nonetheless, through the final years of his career, Bird maintained his status as one of the premier players in the game. He averaged over 20 points, 9 rebounds and 7 assists a game in his last three seasons with the Celtics, and shot better than 45 percent from the field in each. Bird led the Celtics to playoff appearances in each of those three seasons. Bird's body, however, continued to break down. He had been bothered by back problems for years, and his back became progressively worse. After leading the Celtics to a 29-5 start to the 1990-91 season, he missed 22 games due to a compressed nerve root in his back, a condition that would eventually lead to his retirement. He had off-season surgery to remove a disc from his back, but his back problems continued and he missed 37 games during the 1991–92 season. During the 1992 Eastern Conference semi-finals against the Cleveland Cavaliers Bird missed 4 of 7 games in the series due to his back problems. In the summer of 1992, Bird joined Magic Johnson, Michael Jordan and other NBA stars to play for the United States basketball team in that year's 1992 Summer Olympics in Barcelona, Spain. It was the first time in America's Olympic history that the country sent professional basketball players to compete. The "Dream Team" easily won the men's basketball gold medal. Following his Olympic experience, on August 18, 1992, Bird announced his retirement as an NBA player. He finished his career with averages of more than 24 points, 10 rebounds and 6 assists per game, while shooting 49.6 percent from the field, 88.6 percent from the free throw line and 37.6 percent from three-point range. Following Bird's departure, the Celtics promptly retired his jersey number "33." The Celtics employed Bird as a special assistant in the team's front office from 1992 until 1997. In 1997, Bird accepted the position of coach of the Indiana Pacers. Despite having no previous coaching experience, Bird led the Pacers to an Eastern Conference championship in 2000 and two Eastern Conference runner-up finishes the previous two seasons. He was named the NBA Coach of the Year for the 1997-1998 NBA season. Bird resigned as Pacers coach shortly after the end of the 1999-2000 NBA season. In 2003, he returned as the Pacers' President of Basketball Operations, where he oversees team personnel and coaching moves, as well as the team's draft selections. Bird is remembered as one of the foremost clutch performers in the history of the NBA. Few players have performed as brilliantly in critical moments of games. In Game 7 of the 1981 Eastern Conference finals against the rival Philadelphia 76ers, The Sixers led all game. Inside the final minute, Boston and Philadelphia were tied 89–89 when Bird sank a fast-break mid-range pull-up bank shot with his left hand. That basket put the Celtics up 91-89. The Sixers had a chance to win the game, but threw away the lob inbounds pass intended for Julius Erving. The Celtics' 91-90 win put them into the NBA finals for the first time since 1976 and they would go on to win the NBA championship in the Finals, beating the Houston Rockets in six games. In the late stages of the game, Bird also had two key steals, two free throws made, a rebound, and a blocked shot. In 1985 (January 27th), Larry Bird hit a baseline jumper at the buzzer while falling out of bounds to give the Celtics a 128-127 win over Portland. In the series-clinching Game 6 of the 1986 Finals, Bird recorded a triple-double of 29 points, 11 rebounds and 12 assists. In Game 5 of the 1987 Eastern Conference Finals against the Detroit Pistons, with six seconds remaining in the fourth quarter and Boston trailing the Pistons 107–106, Bird stole the inbounds pass from Isiah Thomas. Falling out of bounds, Bird turned and passed the ball to teammate Dennis Johnson, who was cutting to the basket and converted a 2-point layup with less than a second left. The Pistons called a timeout but had no chance of getting off a shot. The dramatic play saved the series for the Celtics who won in 7 games, and they advanced to the Finals. In a game in Washington, D. C. against the Bullets in 1987, the Celtics trailed the Bullets by 3 points with 6 seconds remaining in regulation. A three-pointer by Bird had been waved off because their coach, K. C. Jones, had already called a timeout. Bird then made another three-pointer to send the game into overtime. When the Celtics trailed by two points near the end of the first overtime, Bird was fouled and converted both free throws. In the second overtime, trailing by 1 point with 2 seconds remaining, Bird made a buzzer-beating running shot to win the game, 140–139. In Game 7 of the 1988 Eastern Conference semifinals against the Atlanta Hawks, Bird shot 9 of 10 from the floor in the fourth quarter, scoring 20 points in that quarter and lifting the Celtics to a series-clinching victory over Atlanta. This effort foiled a 45 point performance by Dominique Wilkins in the same game. On March 31, 1991, the Celtics played a double overtime game with the Chicago Bulls in their last meeting of the season. In the second overtime period, Bird scored 9 points on 4 of 5 shooting from the field and helped the Celtics beat the Bulls, 135–132. Many called this particular game Bird's finest performance against Michael Jordan. In the last seconds of a nationally-televised regular season game with the Portland Trail Blazers in March 1992, Bird sent the game into overtime with an off balance running one-handed three-point shot. Bird tallied 49 points, 14 rebounds, 12 assists and 4 steals for his 59th and final career triple-double in what many fans called his last great game in the NBA. The Celtics won in double overtime over the Blazers, 152–148. Bird's 49 points stands as the NBA record for most points scored while registering a triple-double. On March 30, 1983, Bird scored 53 points against the Indiana Pacers to set the Celtic record for highest scoring output in a game by an individual player (the previous record belonged to Sam Jones who scored 51 points against the Detroit Pistons on October 29, 1965). Bird also set the franchise record for most points scored in a quarter with 24 points in the third quarter which has since been equaled by Todd Day against the Minnesota Timberwolves on December 22, 1995. On February 18, 1985, Bird registered a triple double (30 points, 12 rebounds, 10 assists) and also had 9 steals in three quarters of play against the Utah Jazz. Bird sat out the fourth quarter, as the Celtics led 90–66 after the third quarter and won the game 110–94. When asked by reporters if he actually wanted to play in the 4th quarter to get the quadruple double, Bird said "What for? I already did enough damage to them." On March 12, 1985, Bird scored 60 points against the Atlanta Hawks to reclaim the record for highest scoring output in a game by a Celtic, just nine days after teammate Kevin McHale broke Bird's previous record by scoring 56 points against the Detroit Pistons. On April 1, 1987, Bird registered a triple double (17 points, 11 rebounds, 10 assists) by halftime against the Washington Bullets. He finished the game with 30 points, 17 rebounds, and 15 assists. On November 11, 1987, Bird completed the first 40 point–20 rebound game in Celtics history against the Indiana Pacers. On November 10, 1989, Bird scored 50 points against the Atlanta Hawks to register his fourth and final 50 point game in his career. Bird's four career 50 point games stand as the record for most 50 point games by a Celtic. Bird recorded three 40 point triple double games in his professional career. The first was on February 14, 1986 in an overtime win against the Portland Trailblazers. He finished that game with 47 points, 14 rebounds, and 11 assists. The second occurred on December 13, 1989 in a win over the Seattle Supersonics (40 points, 11 rebounds, 10 assists). The last was in a double overtime win against the Portland Trailblazers on March 15, 1992 where Bird finished with 49 points (the record for most points scored while recording a triple double), 14 rebounds, and 12 assists. Bird also totaled 69 triple doubles (59 regular season and 10 postseason) which stands behind Oscar Robertson, Magic Johnson, Wilt Chamberlain, and Jason Kidd for 5th most all-time. During Bird's retirement ceremony Magic Johnson said, Larry, you only told me one lie. You said there will be another Larry Bird. Larry, there will never, ever be another Larry Bird. During his career, he was featured on the cover of Sports Illustrated magazine 11 times, including the cover of the special "40 For the Ages" commemorative issue, featuring the best 40 athletes in the last 40 years. Larry's inspiring accomplishments, dedication to excellence and personal drive were featured prominently in the television programming presented by the NBA in their 50th Anniversary celebration during the 1996-1997 basketball season. He was also inducted into the Indiana State University Hall of Fame in August of 1999, and in that same month he was honored as an Indiana Living Legend by the Indiana Historical Society. Larry Bird has worked as hard off the court as on, becoming a highly desirable corporate and commercial spokesman for a selected number of major business and brand names, including: McDonald's, H.J. Heinz, Microsoft, Gatorade, Hewlett Packard, Nestle, Kraft, Kellogg's, General Mills, Pepsi/Mountain Dew. He has also worked on behalf of numerous charities, including the Boys and Girls Club of Terre Haute, Indiana and the Daniel Marr Boys and Girls Club in Boston. Additionally, Bird requested that all of the proceeds from his successful retirement ceremony held at the Boston Garden in 1992 be shared among 25 Boston charities, thus generating well over a million dollars in revenues to be distributed among them. NBA TV devoted a whole day's worth of programming to chronicling Bird's career on his 50th birthday in 2006. ↑ 1.0 1.1 Larry Bird summary NBA.com. Retrieved August 18, 2008. ↑ Larry J. Bird Enshrined 1998. Hoophall.com. Retrieved August 18, 2008. ↑ 3.0 3.1 CNN/SI - 33: Larry Bird enters the Hall of Fame. sportsillustrated. Retrieved August 18, 2008. ↑ Carrie Rickey, 1988. A Rhinoceros Among The Gazelles Query.nytimes.com. Retrieved August 18, 2008. ↑ NBA Quotes. NBA.com. Retrieved August 18, 2008. ↑ Larry Bird Biography Aiespeakers.com. Retrieved August 19, 2008. Plain and simple, Bird one of the best by Larry Schwartz, ESPN.com. Where Legends Are Born NBA.com. This page was last modified on 21 June 2018, at 20:53.